The photograph shows the High Street, showing (what is now) 27 High Street (the tall building), the Banks cottages beyond. This is a William Shuttlewood (Quorn) postcard posted on 1st February 1909. It was sent from E Riley, Woodlands, Quorn to R. W. Parker Esq, 28 Glamorgan St, Victoria, London, S10. The hand-written message reads: I am afraid our good wishes for the new year are rather late, but we most sincerely hope you have a happy one. We are sending you two old friends to look at. Have been waiting for them to be finished, the man was taken ill directly after taking them. Small wonder I can hear you say! Hope you and all your people are keeping well. Lilian sends her kindest regards. With all good wishes, yrs very sincerely E Riley. 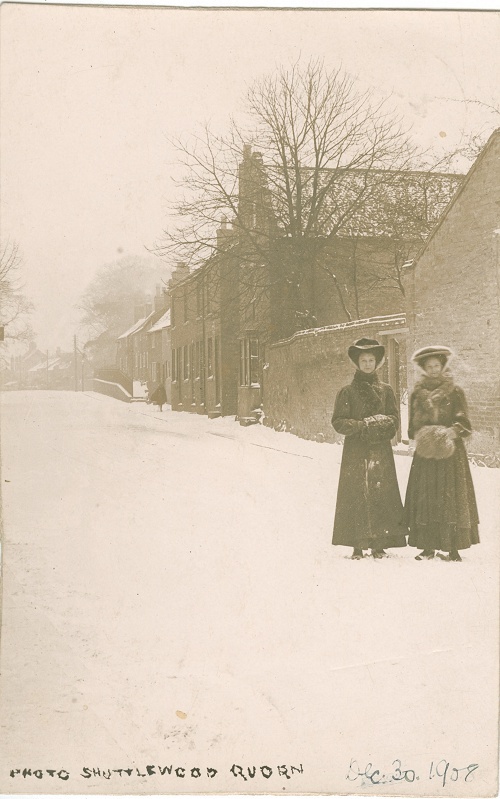 This postcard is a lovely picture in itself and was taken on a snowy winter's day on 30th of December 1908 in Quorn. The location is fairly easy to identify even today. It is taken on High Street, looking towards Loughborough. The tall house on the right is number 27 High Street, which not so many years ago was a newsagents. In the middle distance (a few houses to the left of 27 High Street) can be seen the old cottages (now demolished) which formed "The Banks". The photographer was William Shuttlewood, who lived in Quorn from about 1904 to 1909, and ran the chemist's shop on High Street where James Alvey (the hairdresser) is now. He was obviously the poor soul who was taken ill in early 1909 (see post card message). You can read his full story elsewhere on the site. The two ladies were sisters, Edith and Lillian Riley. Lillian (on the right) was born on 15th November 1886, so was 22 when this photograph was taken. Edith was 31. In 1901 the sisters were living at 55 Welford Road, Leicester with their father Samuel (a picture frame maker - employee), mother Jane, elder sister Florence (teacher) and younger brother Errol. At some point shortly after this, they moved to "Woodlands" Quorn , two houses, which are now 65 and 67 Chaveney Road. Current and period pictures of which are shown below.